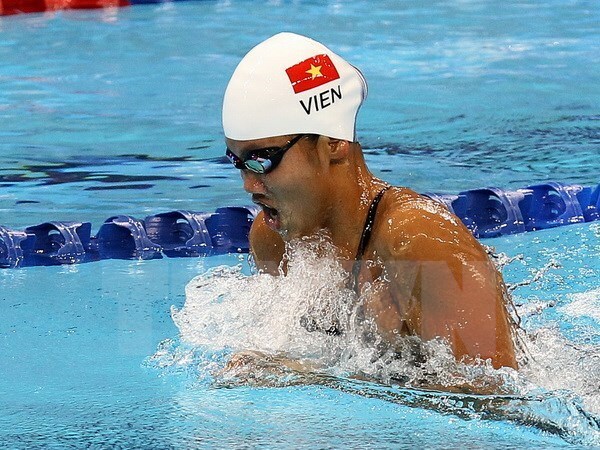 Swimmer Nguyen Thi Anh Vien, a member of the Vietnamese team at the Rio 2016 Olympics. Among the 23 athletes, four are competing in weightlifting, four in fencing, two in swimming, two in shooting, two in badminton, two in gymnastics, two in athletics, two in rowing, two in wrestling and one in Judo. The Minister of Culture, Sports and Tourism on June 29 signed decision No 2238/QD-BVHTTDL on the official list of the Vietnamese sport delegation attending the world’s biggest sports event. Besides the 23 athletes, 27 other members of the delegation are coaches, experts, officials and doctors. The delegation is headed by Tran Duc Phan, deputy head of the General Department of Sports and Physical Training. They is scheduled to leave for Brazil on July 28. The Rio 2016 Olympics will officially open on August 5 and close on August 22. Around 10,500 athletes from 206 nations will compete for medals in 306 events in 28 sports.